APCEL congratulates Jolene Lin on the launch of her book, Governing Climate Change: Global Cities and Transnational Lawmaking. The book launch was held on 24 January 2019 with a fireside chat with Associate Professor Jolene Lin and Ambassador-at-Large Professor Tommy Koh. For more details of the book, click here. Jolene Lin, Associate Professor and APCEL Director, speaks on ‘Climate Change Diplomacy & Litigation’ at Tembusu College Fellow’s Tea (17 October 2018) hosted by Dr Connor Graham. APCEL congratulates our associate members, Dr Joseph Chun and Youna Lyons (CIL) as well as ELSA student members- Eric Bea, Amshar Addy, Carol Yuen, Kim Wong and Sarah Lu for their contributions to the 2018 Singapore Blue Plan. This is the third Blue Plan to preserve Singapore’s rich marine biodiversity, with six recommendations, including improved laws to protect marine environments, formalised management systems for these areas, and sustained funding for long-term research and monitoring programmes. The Plan was presented to Second Minister for National Development, Desmond Lee on 13 Oct 2018. APCEL Advisory Committee member, Emeritus Prof Koh Kheng Lian presented a paper on “Widening the Remit of the Jurisdiction of the International Criminal Court (ICC) to Include Environmental Degradation and Destruction Under ‘Crimes against Humanity’?” at the 15th ASLI Conference held in Seoul National University School of Law (10-11 May 2018). APCEL conducted an international training course for ASEAN judges at the Singapore Judicial College. “Environmental Law: Overview and Challenges in the ASEAN region”, The one-day workshop gave an overview of the latest developments in selected areas of environmental law including biodiversity conservation and climate change. Assoc Prof Burton Ong gave a public talk at the Temasek Life Sciences Laboratory (TLL) on “Access and Benefit-Sharing principles under the CBD and Nagoya Protocol”. In celebration of the International Women’s Day 2018. APCEL Advisory Committee member, Emeritus Prof Koh Kheng Lian (Awardee of 2014 Singapore Women’s Hall of Fame) was invited in the capacity of the former Director of the Asia- Pacific Centre for Environmental Law to be a Guest Speaker at the Catholic Junior College to make a presentation on “What it Means to be a Leader”. APCEL Advisory Committee member, Emeritus Prof Koh Kheng Lian presented a discussant paper "Disruptions in the Environment and Climate Change” at the NTS- Asia Consortium Annual Conference on Resilience in the Face of Disruptions, Novotel Singapore on Stevens. This event was organized by NTS- Asia Consortium and S. Rajaratnam School of International Studies (RSIS), Nanyang Technological University. APCEL Advisory Committee member, Emeritus Prof Koh Kheng Lian (with Mr George Hwang) presented a paper “ASEAN Legal Framework Relating to Cultural / Creative Industries: IP Applicability and Extending its Frontiers?” at the IP and Cultural Industries in South East Asia conference, Singapore Management University. This event was organized by SMU Applied Research Centre for Intellectual Assets and Law in Asia, Wee Kim Wee Centre, and National Gallery Singapore. 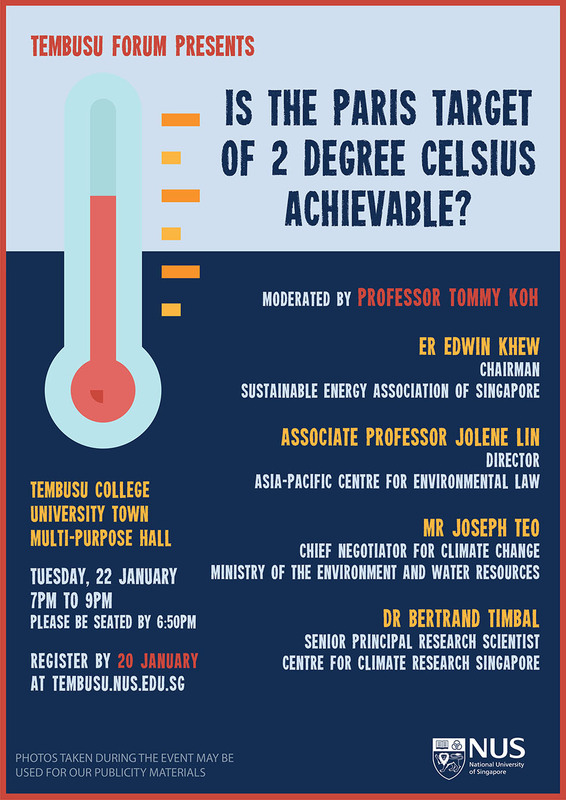 This event was co-organised by APCEL together with the NUS MSc (Env Mgt) [MEM] programme, the NUS Bachelor in Environmental Studies (BES) Programme; the City Developments Pte Ltd and National Parks Board. The speaker was Ms Patricia Zurita, CEO, Birdlife International. Speaker – Dr Maria Marquès i Banqué, Tarragona Centre for Environmental Law Studies, Universitat Rovira i Virgili, Catalonia, Spain. Chair – Assoc Prof Lye Lin Heng, Director, APCEL. Along with the Konrad Adenauer Stiftung (KAS) Energy Security and Climate Change Program and Chinese University of Hong Kong (CUHK)’s Faculty of Law, APCEL co-organized a conference examining the effectiveness of emissions trading in driving investments in the decarbonization of energy supply in China and the EU. The event took placed at CUHK. Prof KL Koh was invited to give a speech at the book launch on “Ambassador Tommy Koh: Professor & Former Dean of the Law Faculty, NUS, and Diplomat/Negotiator at the Earth Summit”. Prof KL Koh was invited by the National Environment Agency of Singapore to conduct a training course, NEA Leaders in Environmental Action (LEAP 2.0) Programme - Global and Regional Perspectives of Environmental Sustainability and Environmental Law, Singapore Environment Institute. Prof KL Koh was invited to participate at the above meeting. She presented a report on the activities of three IUCN members in Singapore namely, APCEL, Nature Society of Singapore and Singapore Zoo. She also participated on the theme of the meeting, nature-based solution. Invited by the Institute of Strategic and International Studies (ISIS), Malaysia, on the occasion of Seminar and Launch of Book, entitled: ASEAN: Future Forward. Essays Commemorating the 50th Anniversary of the Association of Southeast Asian Nations and Anticipating the Next 50 Years. Prof KL Koh contributed a chapter to the above publication entitled “Sustainable Developed ASEAN - 50 Years On: ASEAN Environmental Legal Integration. ?” She was invited to serve on the Panel Discussion –“Visualising ASEAN Next 50 Years”, focusing on “the current state of the people-to-people dynamic in ASEAN”. Prof KL Koh was invited to present a paper on “ASEAN 2025: Forging Ahead Together – Human Security and Human Rights in Climate Challenges” by Konrad Adenauer Stiftung. She was also invited to be a moderator for Panel 3: Legislation on Safeguarding Environment in Asia – is it sufficient? Prof KL Koh was invited as a resource person of the above seminar. Prof KL Koh participated at the above conference. ADB-IUCN Regional Capacity Development Technical Assistance - Strengthening Capacity for Environmental Law in the Asia-Pacific: Developing Environmental Law Champions, Chiang Mai, Thailand. Assoc Prof LH Lye conducted training for the above Train-the-Trainers (TTT) program organised by the IUCN Academy of Environmental Law and funded by the Asian Development Bank. Also attended preliminary and post-training meetings of trainers. Prof KL Koh was invited to present a paper on "ASEAN Legal Framework Relating to Climate Change”, organised by the Rule of Law Programme Asia, Konrad Adenauer Stiftung in cooperation with the Institute of State and Law, Vietnam Academy of Social Sciences. Assoc Prof LH Lye chaired APCEL Seminar on “The Harmonization of National Legal Frameworks as a Strategy to Address Transnational Organized Environmental Crime”, Faculty of Law, NUS. The speaker was Dr Maria Marquès i Banqué, Tarragona Centre for Environmental Law Studies, Universitat Rovira i Virgili, Catalonia, Spain. Assoc Prof LH Lye participated as a resource person at the Academy’s 2nd Regional Roundtable of Asian Environmental Law Champions (Training the Trainers/Teaching the Teachers (TTT), Shangri-La Hotel, Cebu, Philippines. APCEL's Director Assoc Prof LH Lye attended the IUCN Academy of Environmental Law Governing Council meetings as a member of the board of governors representing SEAsia (APCEL is an institutional member of IUCN). She was a resource person at the Academy’s 2nd Regional Roundtable of Asian Environmental Law Champions (Training the Trainers/Teaching the Teachers (TTT) and presented a paper on “Public Housing in Singapore – A Success Story” at the Colloquium. Six students from the NUS Environmental Law Student Association (ELSA), a junior wing of APCEL presented papers at the above Colloquium. Assoc Prof LH Lye was invited to participate at the stakeholder workshop of the International Mangrove Research project “Digging into Sediments and Microbes for Nature Conservation". This project is a collaboration between Germany and Singapore and aims at the conservation and sustainable use of mangroves. Prof KL Koh presented a paper entitled "Integrated ASEAN Community: ASEAN Values - Intangible Cultural Heritage as a Mechanism for Forging an ASEAN Identity". Prof KL Koh was invited to present a paper on "ASEAN: Legal Perspective and Regionalism" by the Universitas Padjadjaran, Faculty of Law. Prof KL Koh was invited to lead the "Panel Session on Environment". Prof KL Koh was invited to attend meeting to discuss the Singapore Sustainability Symposium (S3) as a member of the local S3 Scientific Advisory Board Meeting, Sustainable Earth Office, Nanyang Technological University, Sheraton Towers. Assoc Prof LH Lye was invited to present a paper on Singapore’s Water Law, Policy and Management on 13th April and joined their panel of experts on 14th April to discuss future directions for their new Dyson College Institute for Sustainability and the Environment (DCISE) and possible collaboration. Prof KL Koh was invited to present a paper on ICC and “crimes against humanity”: the Cambodian case of land-grabbing. Assoc Prof LH Lye was invited to attend the film screening of Optimism in a Time of Uncertainty: Before the Flood and panel discussion, organized by the Energy Studies Institute in collaboration with the US Embassy in Singapore and Office of Environmental Sustainability. Assoc Prof LH Lye was invited as Guest Lecturer for the NUS inter-faculty course SSS1207/GES1021 Natural Heritage of Singapore to speak on “Singapore's Natural Heritage - Conservation and Protection Laws”. This is a first year Singapore Studies module, open to students from all disciplines at NUS. Some 400 students attended the Lecture. Prof KL Koh was invited to participate in the Non- Traditional- Security (NTS) Asia Consortium Conference on “Climate Change and Sustainable Development Goals in Asia–Pacific”, Orchard Hotel, Singapore. Assoc Prof LH Lye visited Universiti Brunei Darussalam to publicize the NUS M.Sc. (Env Mgt) [MEM] program and gave a presentation on Environmental Law, Governance and Management. Her visit was hosted by the Universiti’s Institute of Policy Studies, and facilitated by Prof David Koh, Assistant Vice-Chancellor and Vice-President (Research and Innovation) at the Universiti & Professor, Saw Swee Hock School of Public Health, NUS. APCEL's Director Assoc Prof LH Lye and Honorary Director Prof KL Koh were invited to the above event. Prof Lye was chief facilitator for Workgroup 1 “Innovations in Rule of Law, Policies and Environmental Jurisprudence” on 15 March. Assoc Prof LH Lye chaired the MEM Seminar on "Corporate Sustainability 3.0: Moving Beyond Commitment", at the School of Design and Environment, NUS. The speaker was Ms Leong Li Sun, Global Sustainability Manager, DyStar Singapore Pte Ltd.
Prof KL Koh was invited to attend the above meeting arising from the demise of Dr. Wolfgang E. Burhenne to discuss the future of ICEL and the election of the Board of Governors of ICEL members. She is a member of ICEL Board of Executive Governors. She attended the Memoriam of Dr Wolfgang E. Burhenne. Assoc Prof LH Lye co-taught an intensive course on Comparative Environmental Law at Yale University's School of Forestry & Environmental Studies, New Haven, USA, with Adjunct Professor Nicholas Robinson, Elizabeth Haub School of Law, Pace University, New York. Assoc Prof LH Lye was invited by the Singapore Judicial College to give a talk titled "Singapore’s Wildlife Protection Laws and the Regulation of Transnational Trade in Endangered Species" at the Supreme Court. Prof KL Koh was invited to participate and moderate Session 4 comprising five presentations on the “Role of Stakeholders and Participation – Legal Indicators”. Prof KL Koh was invited to attend a “special meeting on haze” organized by Greenpeace Southeast Asia. Prof KL Koh was invited by the Singapore Judicial College established under the auspices of the Supreme Court of Singapore to give a talk on "An Overview of Environmental Law" under its "Professorial Series". Third Asian Judges Symposium on the Environment, Philippines, Manila. Prof KL Koh was invited to present a paper on “Descaling Climate Change and UNSDG 7: Case Study on Sino- Singapore Tianjin Eco-City”. APCEL's Director Assoc Prof LH Lye attended the IUCN Academy of Environmental Law Governing Council meetings as a member of the board of governors representing SEAsia (APCEL is an institutional member of IUCN) and participated in the above Colloquium. She was also invited to attend a book launch on 21 June in which she and Melissa Low contributed a chapter on "Energy and Smart Cities — Perspectives from a City-State, Singapore" in Energy, Governance and Sustainability, JJ Manzano, N Chalifour and LJ Kotze (eds), Edward Elgar Publishing (2016). APCEL's Honorary Director Prof KL Koh presented a paper on “The Environment in Court and Questions of Legitimacy - Promotion of UN Post-2015, SDG 16: ‘Promote peaceful and inclusive societies for sustainable development, provide access to justice for all and build effective accountable and inclusive institutions at all levels’: The ASEAN Context”. She was also invited to Chair the Plenary Session on 22 June 2016. APCEL's Deputy Director Assoc Prof Burton Ong attended the Colloquium. Prof KL Koh presented a paper on "Impact of Globalization in Environmental Legal Education: Teaching of ASEAN Environmental Law- a Transnational Approach". Prof Koh was invited to present a paper on "The Kuala Lumpur Declaration on Combating Transnational Crime: Illicit Wildlife Trade and Effective Governance -Whither ASEAN and the World?" Prof KL Koh was invited to present a paper on “Cultural Diversity and Hybridity: Forging an ASEAN Identity through the Mechanism of Culture”. Prof KL Koh was invited to present a paper on “ASEAN 2025: Forging Ahead Together - Interface Between Rule of Law, Human Rights and Human Security in Climate Change”. The conference was organised by United Nations Environment Programme, National Green Tribunal, Ministry of Environment, Forest & Climate Change and Ministry of Water Resources, India. APCEL's Director A/P LH Lye was Visiting Associate Professor at Yale’s School of Forestry and Environmental Studies (FES) from 11-27 February 2016, to co-teach an intensive course on Comparative Environmental Law with Prof Nicholas Robinson, Gilbert & Sarah Kerlin Professor of Environmental Law, Pace University Law School, New York. This course has been taught regularly since 2003-4 to students from the Yale FES and Law School and implements the MOU between Yale University's FES and the NUS MSc (Env Mgt) [MEM] programme. A/P Lye chairs the NUS MEM programme's Management Committee. 15 – 19 February 2016 ASEAN Conference on Biodiversity, , Bangkok APCEL's Honorary Director Prof KL Koh, and Associate Member Dr Joseph Chun participated at the above conference. APCEL's Director Assoc Prof LH Lye and Honorary Director Prof KL Koh were invited to the above event. Prof Lye gave a presentation on “Trade in Endangered Species – Enhancing Laws and Enforcement At the International, Regional and National Levels”. APCEL is a partner with the organiser in this research project and hosted a workshop in Dec 2014 at NUS Law School. 9 January 2016 Presentation at the Institute of Comparative Law in Japan, Chuo University, Tokyo, Japan Assoc Prof LH Lye was invited to give a seminar on “Global Trade in Endangered Species – New Challenges for Law and Enforcement” at a special seminar for staff members attended by law and political science professors, lawyers, and key members of WWF –Japan, at the above University.